How to go about spotting business opportunities? Business opportunities can also be termed as ideas. The first step for any startup is to get an idea and this is really the eureka moment for the budding entrepreneur. 1. Solving a personal problem. The opportunity lies in understanding whether others also face a similar problem. The Khan Academy started with Salman Khan in 2004 remotely tutoring one of his cousins, interactively using Yahoo Doodle images. Based on feedback from his cousin, additional cousins began to take advantage of the interactive, remote tutoring. The videos' popularity and the testimonials of appreciative students prompted Khan to quit his job in finance as a hedge fund analyst at Connective Capital Management in 2009, and focus on the tutorials (then released under the moniker "Khan Academy") full-time. He spotted an opportunity that a simple and interesting method developed by him can solve the problems many children face n learning Mathematics. 2. People would like to save time and online ordering and delivery business was born. 3. Look for problems which are aplenty in the environment. People in our country want to learn English as this will improve their job opportunities. This is where Veta English Classes of Rajagopalan came in Now it has become a big brand. 4. Phaneedra Sharma could not get leave in advance to go to his home town for Diwali and closer to the festival, tickets were not available and there was no way to know which bus operator had vacant seats. This inspired him to launch Redbus .com, an aggregator portal for buses. The following stories bring out how successful entrepreneurs have spotted opportunities. She and her husband returned from overseas to look after her ailing father-in-law. That is when she realized the need for personal care. They wanted to use technology to predict that something might be wrong with an elderly person. This made them launch ‘Touchkin’ a predictive health care platform using data sensing. Growing smartphones gave them an opportunity to implement their idea.They have received funding from angels. Healthcare Innovation: Your phone can sense if you are depressed. He noticed that while running a software company his young employees were taking expensive loans and were relying on credit cards. Mehra spotted an opportunity and realized that this has a huge potential for organizing loans at lower interest rates with the motto’ Every Percent Counts.’ He launched in 2007 ‘Deal 4 loans’ which received angel funding. Yeramilli noticed in a jewelry shop a young woman being persuaded by her mother to buy traditional jewelry. Her daughter resisted by saying that the jewelry did not go with the western dress she wore. Yeramilli received similar reactions from the younger generation. This is where she spotted an opportunity for fashion jewelry for the youngsters. She started an online jewelry portal ‘Meelorra’ which sourced global designs. She provides fashionable jewelry to the “under jeweled “women of India. Ishdeep worked in Microsoft, USA. He was convinced that he should apply Warren Buffet’s principle of long term returns for investments to his search for a life partner. It took him nearly four years to find his wife. This made him start’ Banihal’, a portal that quickly matches users based on psychometric tests. In all the above four cases the entrepreneurs have been able to raise funds and convert the opportunity they spotted into a business. 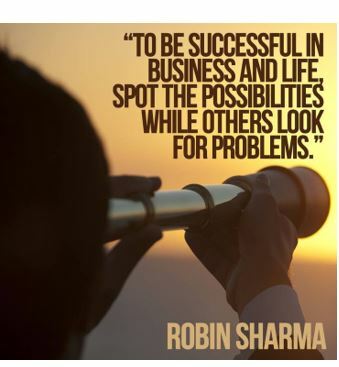 Anyone can spot the opportunities either by watching others having a problem or find a solution to their own problem which many others may also be facing. Observation skills and keeping an ear to the ground are traits of successful entrepreneurs. Spotting an opportunity is the only first step but to convert the idea to a business requires good execution skills. The opportunity should also have sufficient market. If the market already has similar products / services, how can one differentiate their product from others will determine whether opportunity becomes a reality. Business opportunities are like buses. If you miss one, there is always another one.